Few finance issues have received such a wide range of opinions among financial experts than the "housing bubble" in China. This is an issue of international importance because what happens in what is now the world’s 2nd largest economy affects the rest of the world. Differing Views: There are frequent reports of excessively high purchase prices on new housing, which when compared with measures of average household income make it appear that China has the highest house price to income ratios in history. Andy Xie, a Shanghai economist formerly with Morgan Stanley sees a huge housing bubble, which he expects to burst. Stephen Roach, chairman of Morgan Stanley Asia denies there is a bubble, claiming that there is sufficient demand from the continuing migration to the cities for the housing market to be healthy. I have been reluctant to weigh in on the debate, simply because there has been insufficient data available to calculate inferior housing affordability measures (such as average price to average income), much less the data that would permit Median Multiples to be calculated. (The Median Multiple is the "middle" house price divided by the "middle" household income and is optimal for measuring middle income housing affordability). There has been virtually no median household income data. This means that it is impossible to calculate the Median Multiple. Having visited all but two of China's 20 largest urban areas and traversed them, east to west and north to south from the countryside to the countryside (as I do in obtaining photos and impressions for my "Rental Car Tours"), however, two things are obvious. New high-rise housing is being built at a furious pace in the largest urban areas. Nonetheless, the volume of this new housing pales by comparison to the lower rise, older housing that was built before the present boom (which appears to have started in the 1990s). It is clear that the vast majority of people do not live in the new high rise buildings. Nonetheless the press has been filled with absurd reports to the effect that there are 65 million empty housing units in China. The absurdity of this now discredited number is illustrated by the following. (1) All of China's urban areas with more than 500,000 population, where much of the new high rise housing has been built, have less than 300 million people. At the average household size, this means there are no more than 100 million households. In such an environment, 65 million empty units would stick out like a sore thumb. They do not. (3) 65 million vacant units is more houses than have been constructed since 1990. The New National Economic Research Institute Data: Finally, however, some clarity may be being brought to the issue. Credit Suisse sponsored groundbreaking research by National Economic Research Institute (NERI) of the China Reform Foundation in Beijing, which was led by Deputy Director Dr. Wang Xiaolu. Dr. Wang's principal contribution is to show that household incomes are considerably higher in China than official statistics indicate. This "grey income" or "hidden income" includes bonuses paid by local governments, payments to public officials, revenues from land development and other sources of income that are not reported in official data and amounts to 90% more than reported figures (report (Analyzing Chinese Grey Income, published by Credit Suisse). In the top decile (top 90-100% of household incomes), grey income added 200% to reported incomes, while in the second decile (80%-90%), grey income more than doubled reported incomes. Buried in the NERI report is median household income data and average multiple housing affordability indicators that are the best information yet made available. 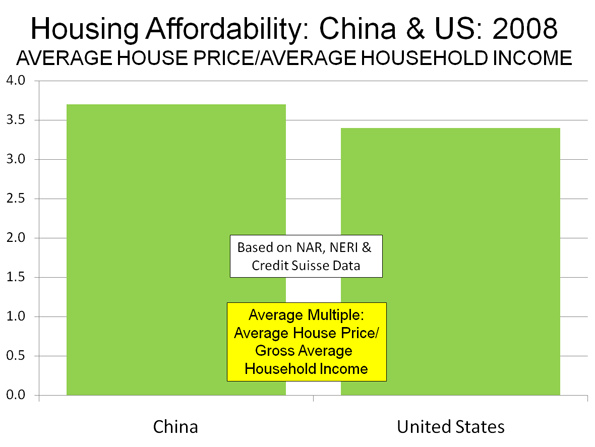 China's Average Multiple: Credit Suisse analyst Jinsong Du takes the NERI further to calculate housing affordability indicators that are far below the claims about the Chinese housing bubble. The average (mean) house price was 4.0 times the average disposable household income in 2008, after accounting for "grey income." Based upon the national ratio of gross income to disposable income (from the China Yearbook), this would indicate an "average multiple" (average house price divided by gross average household income) of 3.7. This is similar to the US average multiple figure of 3.4 (Figure 1) in the same year (2008). In fact, the median priced house could be of a design similar to a Danwei (live-work unit) type design built before 1990. This is the type of housing that any walk or drive through a Chinese urban area will demonstrate to be dominant (and which is illustrated in the photograph above). 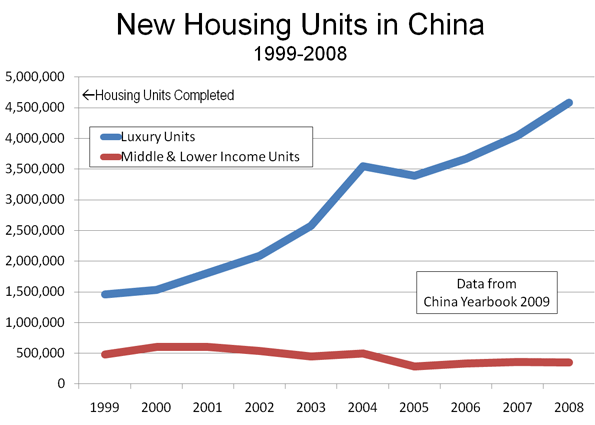 There are huge disparities in both house prices and incomes in China. It would not be surprising for China's Median Multiple to be similar to its average multiple, as is the case in the United States. Further, there is a huge difference between the US bubble and the Chinese bubble. In the United States the bubble drove up prices across all income spectrums in the impacted metropolitan areas. It burst largely because middle income households had taken on debt they could not afford. In China, the bubble may be limited to the top of the income scale, the very households that NERI finds are making two to three times as much as the official reports indicate. China's Sliver of a Bubble: None of this is to suggest that house prices at the top of the market are not high. One of America's leading housing economists, Joseph Gyourko of Wharton, along with Jing Wu and Yongheng Deng found that residential real estate auction prices rose 800% from 2003 to 2008 in Beijing (Note). Recently the government has taken action to cool the high end of the market and to encourage development of more housing for middle and lower income households. At the same time, the Gyourko research team found that new house prices had fallen relative to household incomes in Chengdu, Wuhan, Tianjin and Xi'an, all urban areas with more than 4,000,000 population. To accurately assess housing affordability it is necessary to have complete data. Housing affordability cannot be assessed in London using data from Belgravia, nor will Upper East Side data tell an accurate story about New York. The same is true in China. Stephen Roach said that China has a "sliver of a bubble." That's what the data seems to show. Note: This annual rate of increase is approximately the same as was experienced in per acre government land sales in Las Vegas and Phoenix before the peak of the bubble (both urban areas are tightly ringed by "virtual" urban growth boundaries composed of government owned land).